gaming: Star Wars: The Old Republic - Most Anticipated MMO Since World of Warcraft? Star Wars: The Old Republic - Most Anticipated MMO Since World of Warcraft? For those who aren't aware, World of Warcraft (commonly abbreviated WoW) is a massively MMORPG produced and developed by Blizzard Entertainment (Makers of such acclaimed Diablo series, and Star Craft series) that was released in 2004. According to the website WorldofWarcraft-Answers, there are more than 12 million people consistently playing the game, making it the most successful massively multiplayer game of all time. Many games in WoW's ever lengthening history have attempted to usurp the throne that Blizzard built - and these titles have not been small names; Games like Everquest, Guild Wars, and even have had the might of J.R.R. Tolkien's The Lord of the Rings franchise take a swing. Granted, the latter of the three listed has become a huge intellectual property with a fan base larger than World of Warcraft and the game has picked up a lot of steam since 2007, with gamers complaining that at times, the game is over-crowded. But if you can, think of one franchise that stands out above the rest in sheer size, and dedication. It's a fan base with two costuming regiments, the 501st Regiment "Vader's Fist", and the Rebel Legion. It's the franchise that George Lucas literally built out of six movies, and has thrived via the Expanded Universe and earned the dubious distinction of being the highest grossing franchise of all time: we're talking Star Wars. As of right now, there are two Star Wars MMO's on the market - Galaxies; which is generally considered the "How not to run an MMO", was released in 2003 and had the potential to be in the position that Warcraft is in, but due to mismanagement has become a sparsely populated game being phased out December 15th, 2011. The other is Clone Wars Adventures which is an in-browser gamed based on "The Clone Wars" television series which shows on Cartoon Network and updated after new episodes are released. 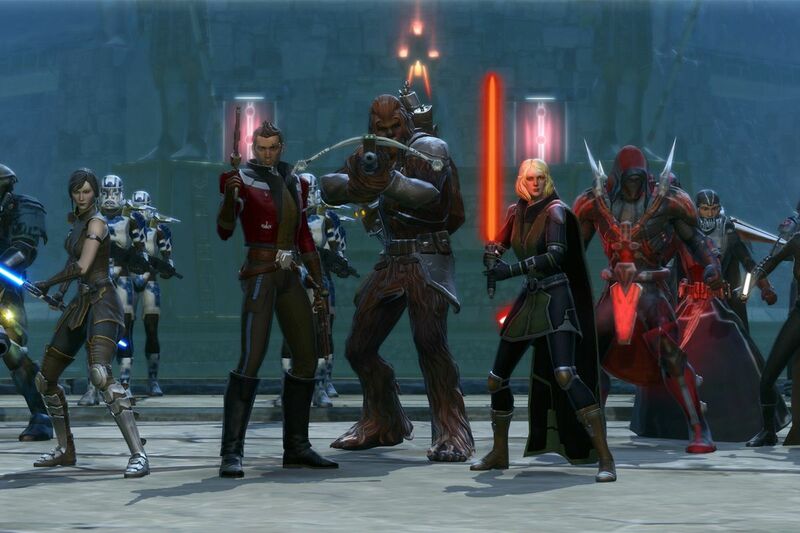 The loss of Galaxies leaves a rift in the space that LucasArts had invested in the MMO market. Although Galaxies is generally considered to have been a failure, there is a new hope in Star Wars: The Old Republic and if all indications are true, this may be the one game to knock Warcraft off the mountain. Some back-story: The Old Republic takes place in the aptly named Old Republic era over the Star Wars Universe - the same timeline as the heavily critically acclaimed Knights of the Old Republic and lesser so Knights of the Old Republic II: Sith Lords. This is about 3,995 years before the events of Episode IV: A New Hope whereas The Old Republic takes place about 3,600 before the movies. The Old Republic (hereby abbreviated as ToR) will be developed by the makers of the heavily acclaimed RPG, Bioware and will see a release by mega giant company, EA Games. ToR was initially announced in 2008 and has been under development since, and with every video be it game play, or the absolutely stunning pre-rendered video - has left people with the jaws dropped and hungry for more. According to , there are more than 1,000,000 active users on the forums discussing the game as of February, 2011 (pre-E3 2011 hype). Along with the release of in-game videos, and rendered trailers, there have been comic tie-ins on for the game, and continually updated information about classes, factions, and other experiences on the . Unfortunately, as of late June, 2011 a release date and playing price (which is estimated to be around $15) has not been released, but EA, LucasArts, and Bioware have confirmed that the game is slated for the later half of 2011. Labels: Star Wars: The Old Republic - Most Anticipated MMO Since World of Warcraft?